When I was but a lass, I became determined that I would follow a musical path. Starting with that old standby, the recorder, I moved onto the cello and, with no success, the guitar, but alas, I was not a natural musician. Although I did not possess the prowess to excel as an instrumentalist, I derive so much pleasure from listening to music and am always on the look out for new pieces and composers, which is how I came by our guest for today, François-Hippolyte Barthélémon. Unlike my good self, Barthélémon showed an impressive talent from a very early age but initially he decided that a career in the military was to be his aim. A comment by a commander regarding his skills as a violinist led him to reevaluate his life and the young man went to Paris. Here he mastered the violin and worked on his own compositions, as well as finding work playing with the orchestra of the famed Comédie-Italienne. Eventually his ambition brought him to London where he performed to acclaim at Marylebone Gardens. His star very much in the ascendancy, Barthélémon performed his first opera, Pelopida, which premiered at the King’s Theatre in 1766. 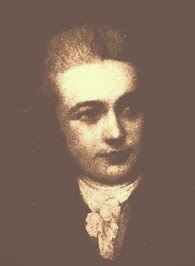 It was heard by the legendary David Garrick, who immediately commissioned Barthélémon to write music for works to be performed at Drury Lane. Whilst in England, Barthélémon enjoyed great success for a series of operas he wrote and he found himself in high demand as a composer and tutor, his professional successes complemented by a happy marriage to singer and musician, Polly Young. Eventually the composer decided that he would remain in England and settled most happily here, successful and celebrated to the last. He's new to me. How fascinating! I've looked in my Vauxhall Gardens book and he's certainly mentioned as Leader of the band until his retirement in 1783. He's also mentioned as being in a Rowlandson-THE famous one of Vauxhall in all it's splendour!! :-) Thank you for bringing him alive to us,Madame! What sights he must have seen!